Easter is approaching as I write and in the past that always meant a big event of some kind. 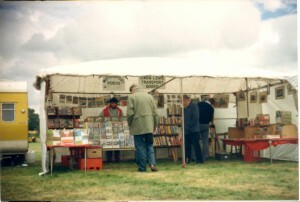 Back in the old days before I had the much-missed shop, when we did around 25 events a year selling books at classic car shows, Easter was one of the high points of the season. Back then, in the 1980’s, when the old sunday-trading laws applied in Britain, the doors of the local B&Q and TESCO stores were shut on Sundays and for the holidays, out door car events of all kinds were pulling in big crowds. There was no retail counter attraction. Happy days! It was possible to do two or three classic car shows or race meetings over the easter holiday weekend and bridge that gap between the winter mail-order season and a summer spent on the road. Later , when we got into competing in rallying and later circuit racing, Easter always provided the first big event of the season – our local circuit at Castle Combe used to attract crowds of nearly 10,000 on Easter Monday and there was a real buzz when competing there. It felt special. The only other date in the year likely to attract as many people to the spectator banks was the far off August Bank Holiday Monday. In recent years , with the trading laws relaxed, an ever encroaching tidal wave of sunday shopping opportunities has swamped many events, cutting back on attendences and reducing the entry, the atmosphere… and the profit potential. Half the potental crowd has gone to a garden centre or a retail park instead of a race track or a car show. Easter is no longer the special spring highight it was a few years before. This year Easter however, is going to be different for us. 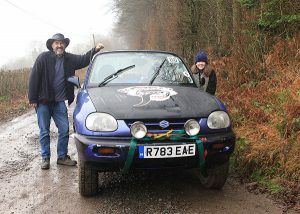 This year we are back in active motor sport and heading, as others have done ever year (war permitting) since 1908 to the far reaches of Cornwall for the LANDS END TRIAL. If all goes to plan, this Easter my daughter Charlotte and I will be aboard our little Suzuki X90 “The Gas Monkey” , laiden with spare wheels a tyre pump, a flask of coffee and no doubt a lot of snacks. From the start in Cirencester we’ll be heading off into the Good Friday evening darkness with another 400 or so competitors on 4, 3 and 2 wheels in search of over a dozen steep, treacherous, slippery hills which make up the ‘observed sections’ between us and the finish line in southern Cornwall – E.T.A. sometime the next afternoon. The aim is to ‘clean’ all of them by not getting stuck before reaching the top. If we can do do that , and it’s a very tall order, and keep within the prescribed time limits, we will bag a Gold Award… failing one section would reduce this to a silver, failing two would mean a bronze, but any more than that and we would have to be satisfied with a finishers certificate….if we make it to the finish of course (also a tall order)! Some of these ‘sections’ have been in use for nearly 100 years. Blue Hills Mine and Beggars Roost feature in contemporary magazine reports back in the 1920s and 1930s when many a famous motoring name competed on the event from sports car makers Sidney Allard and Donald Healey and Le Mans winning ‘Bentley Boy’ SCH Davis to Stirling Moss’s mother & father. Yet despite this long, rich history and continued popularity among competitors it’s an event that no longer gets much conventional media attention. 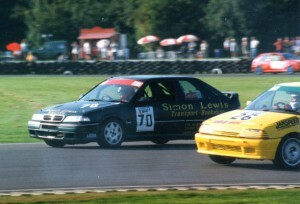 In some respects it’s probably British motor sports biggest little-known event and as such has retained that gloriously amateur nature that most events have long since shed. 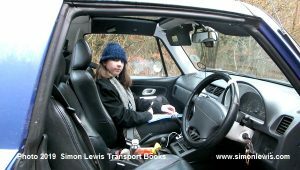 Charlotte, who’ll be navigating me along the 300+ mile route , is 12 years old and this is the minimum age for a competing on the event – from the passenger seat of course . 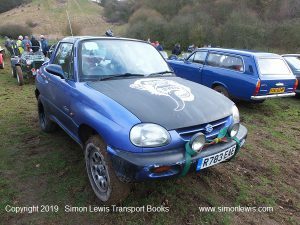 I havn’t competed in any motor sport for 16 years prior to this season and despite having done rallying, racing, autograss, hilllclimbs, sprints and even sand racing in the past had never entered on a car trial of this nature untill 2019. We needed a bit of practice to get ourselves attuned to the car and the requirements of such events and now have two car trials under our belts to this end. The first, the CLEE HILLS TRIAL , I covered in my previous blog and we did OK for total novices as we roamed around the lanes and woods of Shropshire . It was enormous fun. 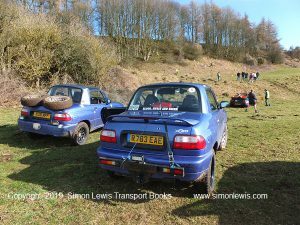 The second was a shorter, sharper event on the Cotswolds, the SYDE TRIAL organised by Stroud Motor Club. This one was all based in one valley and while it was very different to what we’ll face on the Lands End , it did teach us a good deal about running the Suzuki on slippery surfaces. We made a diabolical start (sorry Charotte, hands-up I made a diabolical start..) hardly getting off the line on the first few sections and as a result we never rose from the tail of the field. But we did finish in one piece and we were doing so much better by the end that it was a bit frustrating to have given away so many marks early on. But thats the point of practice, I guess. We learned. So now we’re in that waiting phase of the Lands End Trial. The car is up together and ready to go. We know roughly where in the field we should be starting (yet to be confirmed, but last time we looked, second car away!) I’ve watched numerous in-car videos of previous year’s events on YouTube, the food has been organised by Charlotte’s younger sister, Georgie, who has embraced the role of Catering Manager this season and accomodation is booked in Cornwall. It’s all looking like a proper adventure. Something new and unknown. A shot, literally, in the dark for us both and we can’t wait to get going! As with all the motor sport I have ever done, the waiting is the worst part.